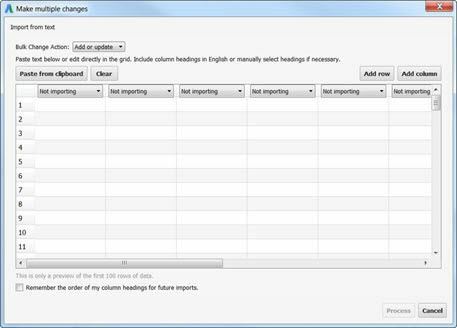 In this section, we look at components specific to AdWords Editor, what we mean by this is things like ‘how to post changes’ or import CSV files. If you would like to know what a keyword is or how to build an account, please see relevant articles on these topics in the SEM Knowledge Base. Here you will find interface commands between offline and online data. We discuss each one below in more detail. Clicking this will open up the below screen, allowing you to choose which account you would like to manage. This is more relevant if you manage multiple accounts. Follow the link for more information on accounts and what all the settings for this are, how they work and how to use them. From here you can choose what of the account you would like to download. 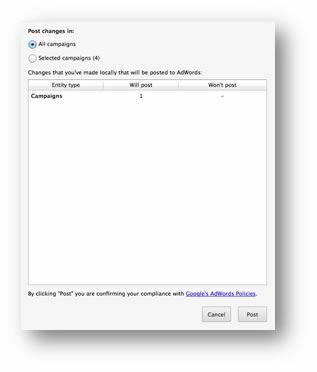 Campaigns already downloaded: This will download changes only for campaigns you have currently downloaded into AdWords Editor. Campaigns that I select: Here you will have the option to choose from a directory style list with tick boxes, what you would like to download. Depending on the size of the account and the speed of your internet connection this can take anything from seconds to minutes to complete. There are two options provided here, either get basic data or ‘more data’, the main difference being how long it takes to perform the download. If you are intending on looking at statistics, you will need to download ‘more data’ but for daily usage the basic option is more than adequate. 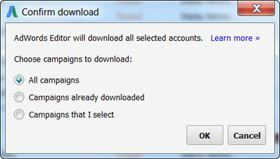 99% of the time, downloading ‘all campaigns’ will be the one you select. Red = Conflicting changes, meaning that you have unposted local changes in Editor that conflict with changes made to the live account. This is most commonly where someone has made a change to the account since you last downloaded it, then you have made a change offline that conflicts with this. Purple = Unposted, meaning that your unposted local changes that are yet to be uploaded. These do not conflict with posted changes though. Green = Downloaded changes; these are the changes that you have just downloaded. This will not highlight components that have not changed since the last download. Click the ‘done’ button to close this. There are two options for this, either post changes or (at the time of writing) post URL changes. The latter option is the result of changes in URLs and how they are handled by the system and is not often used. You can see here how many changes Google will attempt to post, once you click ‘post’. We say attempt, because Editor will often highlight errors and it will not post errors. 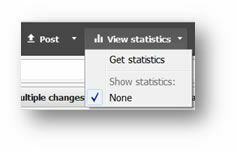 Here it is possible to download statistical data from AdWords. 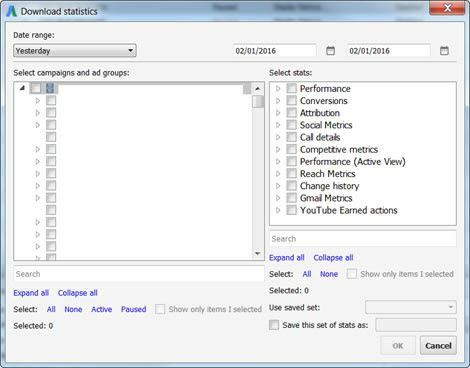 There are a range of options to allow you control over what you download, you can choose specific metrics, campaigns, date ranges, etc and filter these through the interface below. Here we are referring to the “account” option on the dropdown menu, from here you can export the account in various formats and also import changes. We describe each option is each the account tab below. 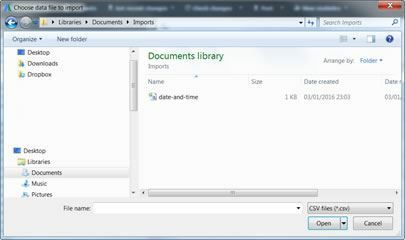 You can import either from file (CSV file) or from pasting text. All columns must be headed, at which point you can click to ‘process’ this. Selecting this opens an explorer window allowing you to navigate to the desired location from which to load the file. Only files that can be opened will be shown in this window. This is where you can export the account or parts of the account to various formats such as .CSV file. This is useful if you need to back up the account or parts of it before implementing new changes. You can also use this feature to share your unposted changes with another account manager. Typically, exports are produced in a .CSV format and downloaded to a location that you specify. 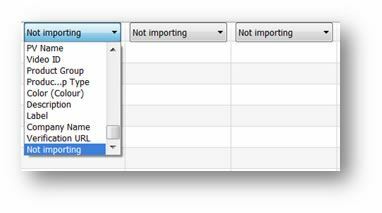 This, the first of the three options, allows you to export the entire account. This will be a significantly large file if the account is big, as this typically contains a lot of components. Even small accounts can be surprisingly large files. This will export everything currently showing in the pane numbered ‘5’ as described earlier in this guide. Again, this will be saved as a .CSV file to a location of your choosing. We cover these features earlier in this article; these features are also accessible from the Account drop down menu. 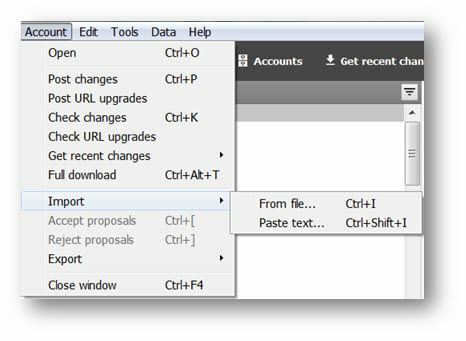 Clicking ‘OK’ will not only download the complete account, it will overwrite any changes that you have made in AdWords Editor. Thus, if you have unposted changes, you will need to back them up or lose them. 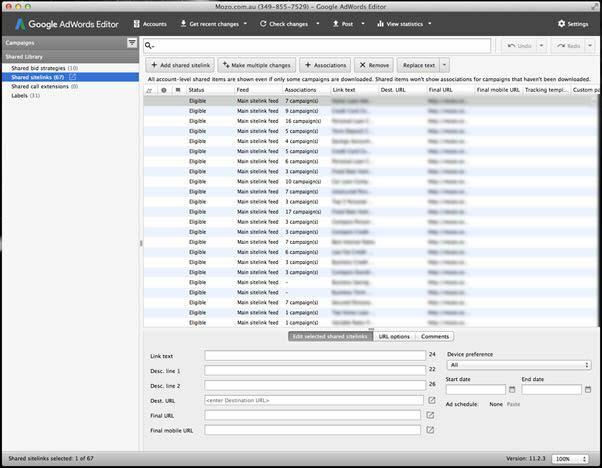 Selecting this feature will enable you to search your account or parts of it for duplicate keywords. 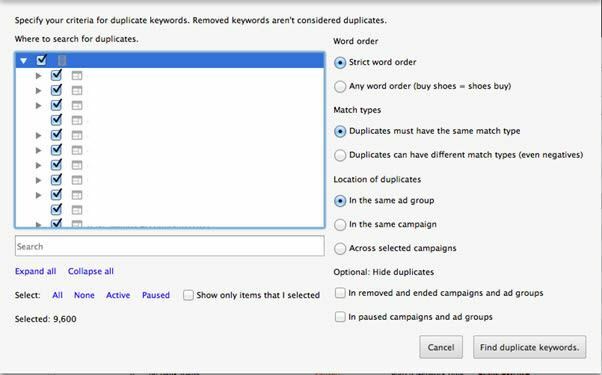 This is a very valuable feature of AdWords, having duplicate keywords throughout an account will result in you losing control of which ad is appearing. This kind of setup will force Google to choose which ad to show and consequently this may not be the most relevant and may not lead to the most relevant landing page. This is especially important when reviewing or managing new accounts that you are unfamiliar with. Allowing you to identify where inefficiencies exist within the account. 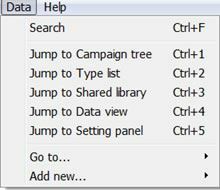 If this is selected, the window (see below image) will appear; from there you can select which campaigns or ad groups you would like to search within. This allows you to filter out / in keywords from based on the order in which the words you are searching for appear in. For example, if you search for ‘buy shoes’, do you want to see ‘shoes buy’. This can be useful if looking for broad match keywords or broad match modified keywords, where the order of the words is less relevant to the search term. Here you can specify whether the filtered results are to include keywords with either the ‘same’ or ‘different’ match types. Often an account will have the same keyword in the account on different match types as part of best practices and account structure. This may be a problem if all keyword match types for the same keyword exist in the same ad group. This allows you to narrow your search to identify specific problems within the account. If AdWords doesn’t show filtered results or if you click between panes, this can sometimes cause issues, this ‘refresh’ button can refresh the results showing in pane ‘5’ of the app. This will remove any filters you have added, ensuring that the contents of pane ‘5’ are showing all available components (not filtering any results out). Forgetting to remove filters can cause temporary issues for new users, as this can look like some to all of the account is missing. Clearing filters is a good habit to get into when beginning to work, as this prevents problems with dealing with filtered data unintentionally. Selecting this will put the cursor in the Search field allowing you to being searching / filtering data within the data view (pane 5). 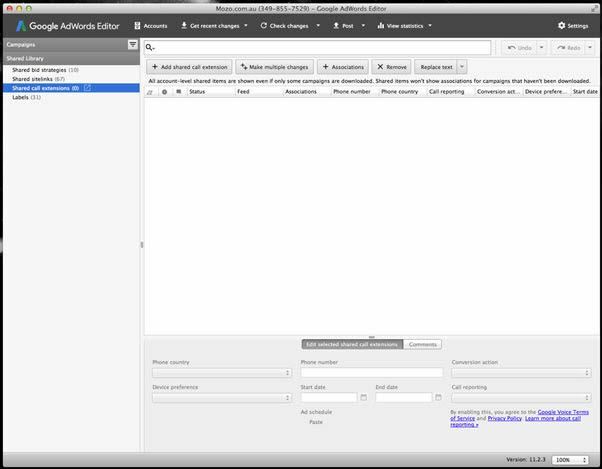 We covering AdWords Editor ‘searching and filters’ later in this guide. This selects the Campaign Tree otherwise referred to as pane 1. This selects the Type List otherwise referred to as pane 2. Otherwise referred to as custom bid strategies, these are applied to campaigns and ad groups throughout the account and as such are ‘shared’. They can be applied to both Search and Display campaigns and help to automate bidding for specific goals. 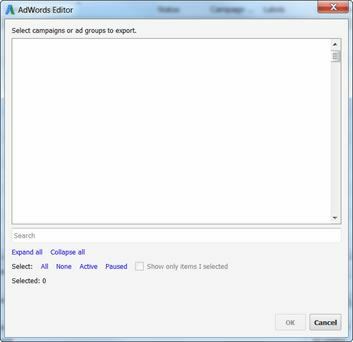 In order to edit these, you must be logged into the AdWords account online; these cannot be edited in AdWords Editor. Sitelinks are another common resource / component that are shared across campaigns and are thus included within this section of the application. 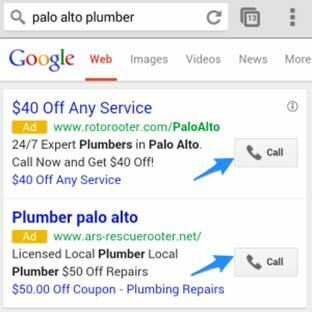 Call extensions allow users to click on a number or ‘call’ button to directly call from an ad in the SERPs. 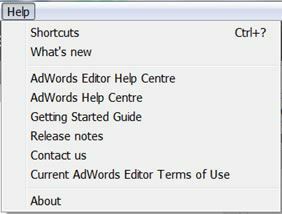 These can be added and edited within AdWords Editor. The screenshot below shows the options available for editing call extensions, there are not a lot of options for this and most are self-explanatory. We cover this in more depth in a guide on Extensions. Labels are literally a ‘label’ that can be applied to a campaign, ad group, keyword or ad. 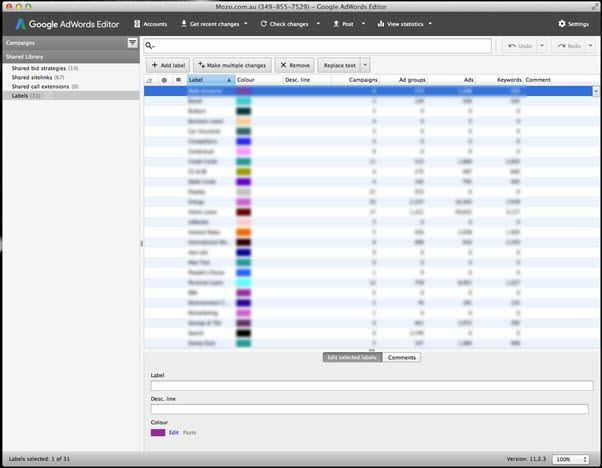 Many labels can be added to any component of the account and this is predominantly used for segmenting data… For example, you can add a label to all campaigns that sell shoes that reads ‘shoes’, thus enabling you to filter campaigns by label to only show you ‘shoes’ campaigns or to show you all campaigns that are not ‘shoes’ campaigns. This has no impact on account performance but is rather a feature to assist in management of the account. This activates the ‘data view’ pane otherwise referred to as pane ‘5’. This activates the ‘setting panel’ otherwise referred to as pane ‘6’. 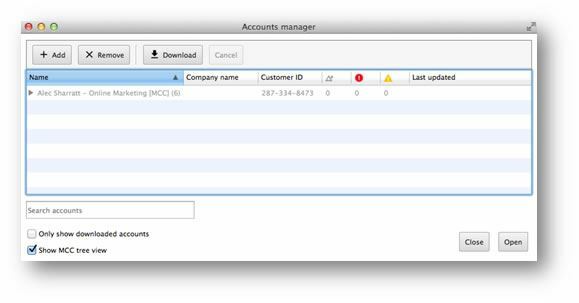 This allows you to jump to / select components of the account specifically if you are unable to navigate to them in the application. If ever you cannot find where to edit something, search for it in this exhaustive list. 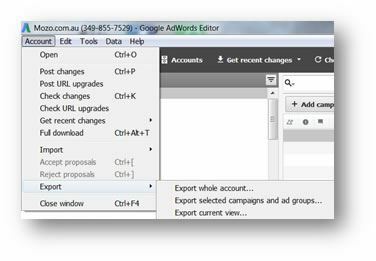 Here you can add any component of an AdWords account available to add or edit within AdWords Editor. This is not the most common way of accessing options, but like the ‘go to’ feature, this provides an exhaustive list of components that can be added. Most of these options will load support from Google in an Internet browser window, because the aim of this article is to cover the operation of the application, we do not cover each of these options here.